The best podcasts for kids are great ways to discover new stories. They're perfect for bedtime, road trips and more. If your young'uns are looking to go on a journey, make sure they have headphones at the ready. The best podcasts for kids will take them into a new world without moving a muscle! No matter their interests, there's something they'll be able to enjoy. 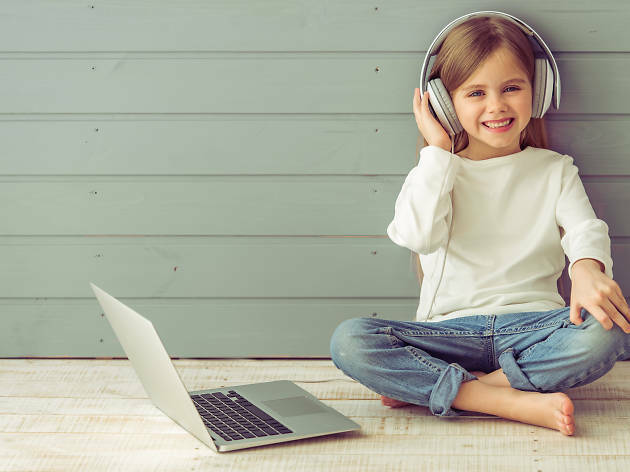 From mysteries and comedies, to fairy tales and science explorations, these podcasts provide an opportunity to learn, explore and have fun. Chances are, mom and dad will want to get in on the action, too! The next time you're traveling in the car or can't find a tale that sends them to bed peacefully, check out these amazing audio opportunities—you won't be disappointed! After you've listened to Tumble, Story Pirates and Peace Out and the rest of the best podcasts for kids on our list, check out the best children's books, storytimes for kids in NYC and museums for kids. Have a budding scientist on your hands? Then Tumble is an absolute must. Experts in the field stop by to discuss their own work, uncover phenomenons and make your kids fall in love with the subject in the process. Storyteller Eric James O'Keefe turns kids' questions into wacky scenarios in What If World, so if your tots are inquisitive, send in their question and let the fun unfold from there! Do your kiddies have a burning question? Perfect! Send 'em in! Brains On! finds a different expert for each episode who will address tots' curiosity. Anything from animal farts (yuck) to narwhals have been covered! NPR's beloved children's podcast explores the depths of space, technology and other fascinating scientific topics. Hosts Mindy and Guy put an entertaining spin on each discussion, beckoning kids into their world, making them curious to learn more. When eyelids get heavy, tuck the kids into bed and select the perfect adventure on Story Time. These 20-minute-long podcast episodes are perfect for the end of the day and are split up according to age brackets. Everyone in your brood will be able to find something to their liking. Who better to entertain kids than kids? Story Pirates does just that. In these adventures, comedians, actors and performers bring children's tales to life. Even better? You can also see their work on stage in NYC! No TV, no problem! Your tot's favorite characters can come along for the journey—regardless of your whereabouts—thanks to the Sesame Street podcast. Join Elmo, Big Bird and the whole furry gang as they learn about friendship, manners and more. Listen here. Dr. Floyd and the wicked Dr. Steve—the mastermind behind evil plans—are at odds, but listeners certainly won't mind. As the two act as thorns in each other's sides, kiddies will be taken on a journey that covers history, geography and science—a fun and unique way to spice up school subjects. Calling all fans of Stranger Things—this one's for you! This Peabody Award-winning podcast (appropriate for middle-grade students) uses a cast of actual middle school kids to tell the tale of an 11-year-old boy who goes off in search of his missing buddies. 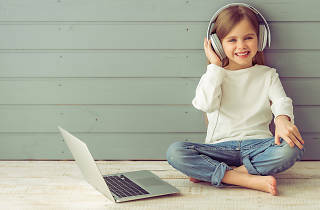 Introduce your tots to great music with a weekly curated list of “indie music for indie kids.” Not only will children enjoy starting the day listening to music made for kids, but parents will be delighted to discover that age-appropriate tracks from some of their favorite bands routinely make the cut as well. It’s a fun way to start the weekend off on the right (dancing) foot. Take a sci-fi trip with Finn Caspian, his friends and their pet robots as their hurl through space aboard the Famous Marlowe 280 Interplanetary Exploratory Space Station. Kids will eagerly follow their misadventures as they explore strange planets, meet aliens and gather feedback from listeners on where their intergalactic journey should take them next. Even little ones need to feel calm and zen. Thanks to Peace Out, youngsters can tackle the subject of mindfulness as they're guided through activities, relaxing stories and breathing techniques. Adorable seven-year-old Eva Karpman and her mom Olga interview celebrities, entrepreneurs, award-winners and experts in a variety of industries to answer questions and encourage kids to dream big. Older children who still want to hear a great story before drifting off to sleep will enjoy this storytelling podcast. Not only will they discover original tales and timeless classics, but they’ll also learn new vocabulary and cut back on screen time right before bed. Part Lois Lane, part Nancy Drew, Eleanor Amplified is a radio host who will take kiddos along for her journey as she cracks the big story. Ideal for those ages 8–12, this podcast is a great way to introduce little ones to the journalism world in an inviting way. Five Minutes with Dad is not unlike the conversations that happen in your family. You'll love how this pop and his two kids tackle everyday issues—staying positive in school, losing a tooth, showing appreciation for your relatives, among other topics. You won't be able to resist this charming, relatable trio. Storynory has it all—fairytales, myths, educational stories and even music and poetry for free. With a touch of humor and a helping of curiosity, Short & Curly focuses on ethics while exploring topics in pop culture, tech and everyday life. Some previous episodes include, "Was Robin Hood right? Should you rob the rich to help the poor?" and "What's the point of a school uniform? "—totally relevant as kids prepare for back-to-school season. Wind down at the end of the night by tucking in, turning on the nightlight, grabbing a teddy and listening to original content from Little Stories for Tiny People. Think of this podcast as a bedtime story in audio form. Tweens looking for new books to add to their collection will find new ones to dive into after listening in on this bi-weekly podcast. They’ll hear other kids chatting about a great story, along with other literary recommendations and celeb guests who will read an excerpt from the week’s chosen title.